GPs are calling on Westminster "to take immediate steps" to offset the effects of Brexit on the Northern Ireland health service. The move came at the British Medical Association (BMA) conference. More than 600 GPs passed a motion recognising the "devastating effect" Brexit may have on healthcare in the UK, particularly Northern Ireland. The Department of Health in Northern Ireland said it is "mindful that this is an uncertain time for everyone". It added that "its intensive contingency planning is a major priority both within the department and across the Health and Social Care system." 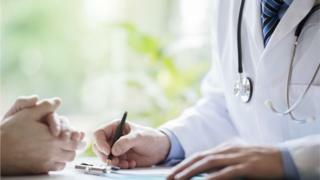 Dr Frances O'Hagan, who is a GP in the Irish border area and works in the southern health trust, said uncertainty for patients and staff was not good. "A no-deal Brexit is an absolute nightmare for us, but even with a deal we have the problem of the recognition of medical professional qualifications," she said. "That means that for both the GPs and their staff, if their qualifications are not recognised people will not be able to work and that could bring our services to its knees and could close our doors on the Monday morning after Brexit." Dr Michael McKenna, a GP in west Belfast, said that the unknown is causing confusion. "This is very important. We need to know what is happening, we need to be organised to be able to deal with every eventuality," he said. "Take, for instance, the transfer of data - that's people's medical notes. If someone is working away or on holiday in an EU country and takes ill when they come back to Northern Ireland, as GPs we will need their notes. "It may not be that easy to transfer them." In a statement, the Department of Health said that "no immediate impact is anticipated on the day-today provision of health and social care services." It added that "structures and processes have been put in place to deal with any potential disruption should it occur." "The safety of people receiving health and social care services is the top priority for the department and intensive planning has been ongoing in conjunction with the Department of Health and Social Care (London) to ensure that people continue to get the medicines they need when the UK leaves the European Union," it said. Despite no Brexit deal being agreed, Paul Laffin, who works for the BMA in Brussels, said that GPs are not being alarmist. "We aren't scaremongering because we have taken the time, as an association, to go out and survey nearly 2,000 EA qualified BMA members to ask them what Brexit means for them and the response is clear: It is uncertainty," he said. The Royal College of Nursing said the supply of medicines is its biggest worry. "If there was any concerns getting medicines into Northern Ireland, that would have a huge impact on patients especially those who require critical medications," said Rita Devlin, head of professional development. "Those patients rely on medication to keep them in a stable state. If there was any interruption in their care due to a lack of meds, those patients could find themselves severely ill and the health service would need to look after them within the hospitals." But stockpiling could be problematic, according to some sources. As well as medicines, other nursing materials could be in short supply, for instance supply and delivery of incontinence pads which come from outside of Northern Ireland.